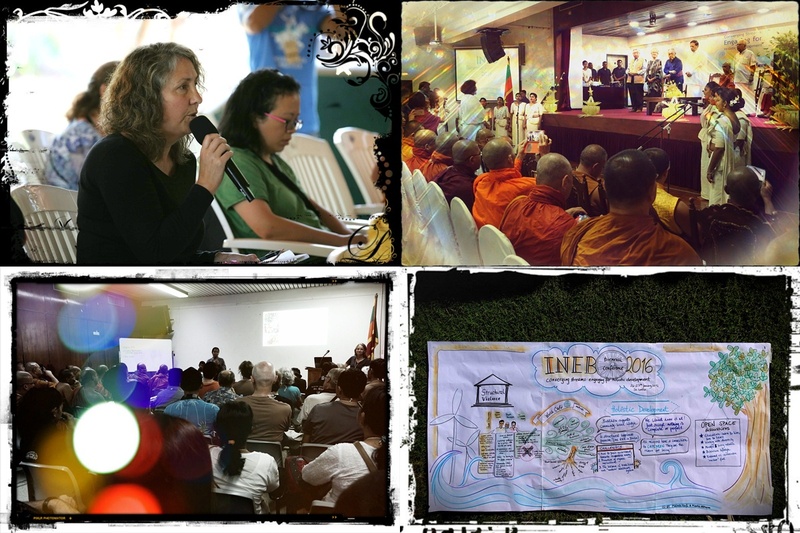 The International Network of Engaged Buddhists (INEB) held its 2016 biennial conference from January 22 – 28 in Sri Lanka organized by INEB, Sadahan Sevana, the Sevalanka Foundation and the International Buddhist Confederation (IBC). Approximately 200 persons from 22 countries interacted in various processes of interfaith dialogue focusing on peace and sustainability. The majority of persons came from Asian countries including Laos, Myanmar, China, S. Korea, Siam/Thailand, Malaysia, Indonesia, Japan, Taiwan, India, and Sri Lanka, with otherscoming from Canada, the USA, Hungary, Austria, and Australia. This year’s conference theme was Converging Streams: Engaging for Structural Development.The opening public symposium on the evening of January 22 at the Sri Lankan Foundation in Colombo began with chanting accompanied by traditional instruments which brought a feeling of calm and unity to the gathering. This symposium was particularly auspicious as the President of Sri Lanka, Maithreepala Sirisena, shared the stage with luminaries in the fields of engaged Buddhism, climate change, and holistic and sustainable development. To unite for our common good, to collectively embrace a new paradigm where economics and politics serve life and sustainability; where our differences enrich us to live as one human family, to be mindful of what is needed now and those generations yet to be born. To abandon growth-based economics; to commit to the Great Turning towards sustainability, total elimination of fossil fuels, healthy and toxin-free agriculture, moral and physical wellness, and a life-centered approach to sustainability. May we be rigorous in our efforts, respecting all life-forms and embrace the opportunity of this Ecological Conversation. Let us be guardians and champions of these changes; let us have faith in our common destiny. Nigel Crawhall, who moderated the panel of respondents, began by stating that “this was a historic gathering, as we are facing the greatest challenge on earth,”then went on, to introduce the panelists all of whom have lifetime commitments to supporting peace on the planet. Key messages given by the respondents including Venerable Lama Lobsang noting the need to move out of the monastery and temple to look for common solutions to our problems. Dr. Ariyaratne recommended solving these with an approach that combines spirituality with communication technology.Sulak Sivaraksa spoke about structural violence saying that it was systematically preventing people from meeting their basic needs. This was followed by reminding the audience that each person is on a personal quest that leads each of us to finding common ground because we are actually interrelated. Lodi Gyari Rinpoche commented that sustainability is needed within ourselves and that sustainability of our beliefs begins with ourselves which requires putting beliefs into action. Venerable Ratthana closed by appealing to everyone to support the agreement that was read, then went on to say that spiritual leadership and collective effort is necessary for it to be put into practice. The participants ventured on two separate study toursdesigned to help them to understand the country context that prepared them for the conference that followed. The two groups traveled in different directions, one to examine the topic of ecosystems, climate change and sustainable developmentin the Sinharaja Forest Reserve in southern Sri Lankawhile the second group learned aboutpluralistic and inclusive societiesliving in the post-war conditions of Jaffna in northern Sri Lanka. Participants on both study tours formed relationships while traveling long distances through the countryside as they learned about the issues, in these areas. 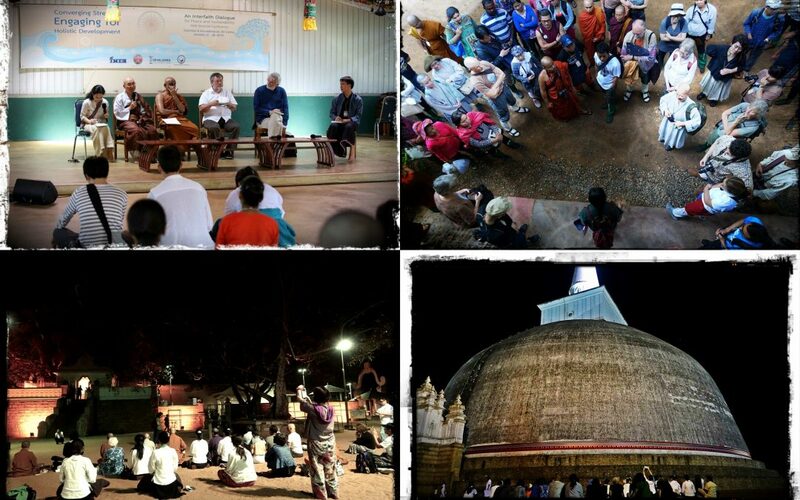 Both groups met at the Islander Center in Anuradhapura, Sri Lanka, for the two day conference. During the morning of the first day, panelistsgave presentations about structural violence and its impact on societies and development. The second morning, another panel addressed the topic of holistic development. These presentations provided the building blocks for the afternoon sessions. 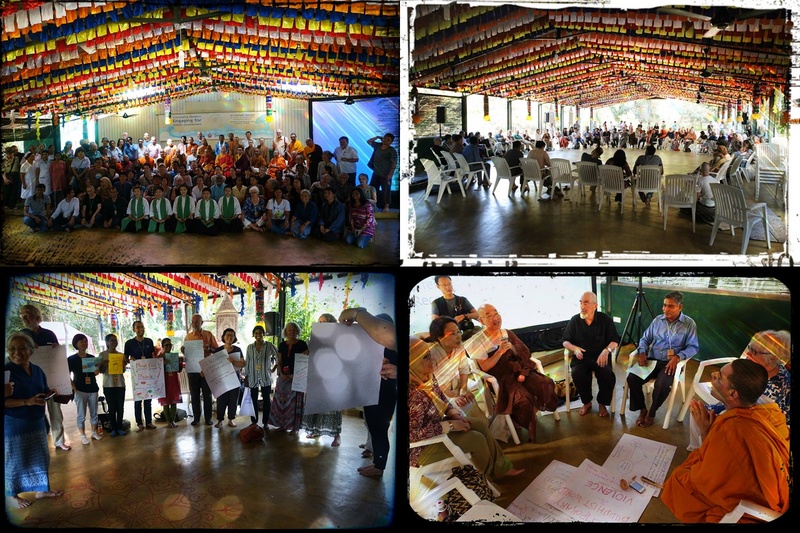 The conference provided many other formal and informal opportunities for participants to interact during pre-conference workshops, cultural presentations of tea ceremonies, performances by musicians and dancers, meditation, as well as shared meals and accommodations. The successful outcome of INEB’s conference has yet to be realized, however the seeds have been carefully sown across countries and cultures as people return home with new ideas and approaches to holistic development, as well as a clearer understanding of the negative effect structural violence has on everyone. INEB’s network has also been strengthened and broadened as it continues to reach out to other faith traditions as partners and collaborators on issues of common concern. In 1989, the International Network of Engaged Buddhists (INEB) was established in Siam (Thailand) by Sulak Sivaraksa and a group of Buddhist and non-Buddhistthinkers and social activists. INEB operates as an autonomous organization under the Bangkok-based Sathirakoses-Nagapradeepa Foundation. Over the years the network has expanded to include members, both individuals and organizations, from more than 25 countries across Asia, Europe, North America and Australia. From this diversity, an understanding of socially engaged Buddhism has emerged which integrates the practice of Buddhism with social action for a healthy, just, and peaceful world.